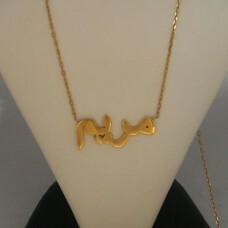 Arabic name Pendant, Easy to wear on daily basis. Attractive designs and quality. Your shopping search has come to an end, we guarantee you will Love it. This product is also available in Artificial, Silver, Gold, Gold & Diamond. Note: Price is for Pendant only, chain is sold separately. Arabic name Pendant, Easy to wear on daily basis. Attractive designs and quality. Your shopping search has come to an end, we guarantee you will Love it. This product is also available in Artificial, Silver, Gold 18k, Gold 18k & 1 Diamond.